Confession time. 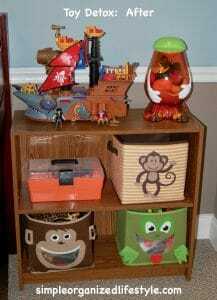 If you’ve ever read my “About” page, it’s known that there are three constant struggle areas around here… toys being the main one! Toys are seriously out of control in our home. Toys are a hard battle for us because the majority of them are gifts from people who love our child and his enthusiasm for a new toy. They only have the best of intentions. But… too many toys have led to overwhelm, a short attention span, and not enough creative play in our home. What he loves most (time and experiences with us) is often cut short because we’re always picking up toys! 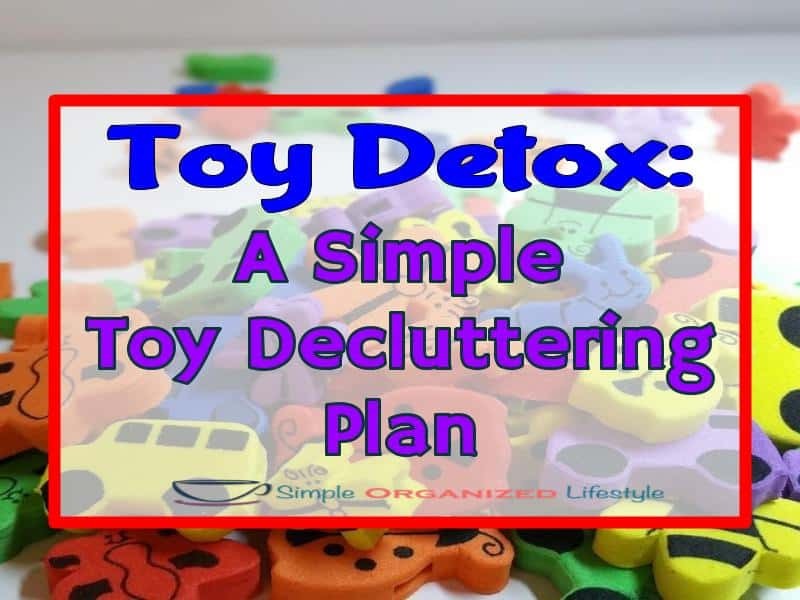 This led to a search to find a good system, which led to the Toy Detox, a simple step by step plan to declutter the toys by Denaye Barahona of Simple Families. Yes, please… someone who has this figured out to tell me where to start and what to do! 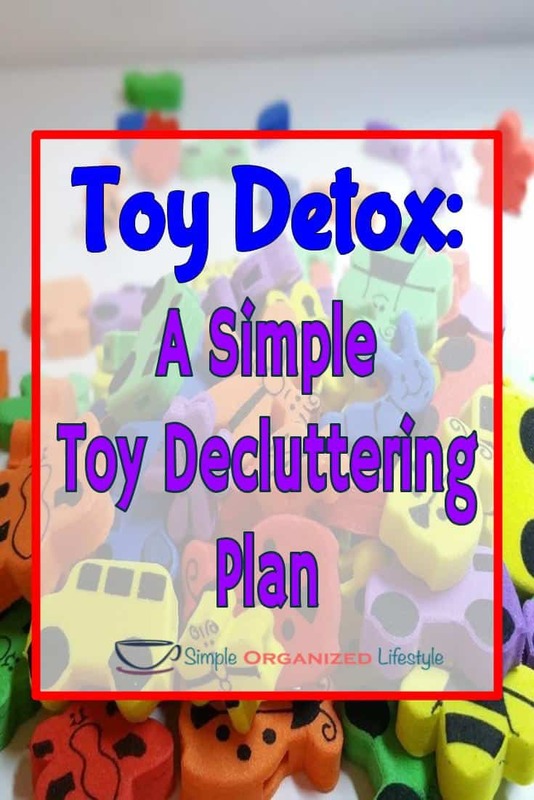 It went through the process of why and how to declutter toys with short videos that were full of helpful information about minimizing toys and creating a simple play area. It also included tips for approaching the issue with family and friends. Dr. Barahona gives a tour of her kids’ playroom and discusses why she chose the toys in their playroom. I had three “head nod, amen” moments when going through the course. It’s the case of less really is more. Kids need things to be as simple and clear as possible. Yes and YES! A lot of toys take the “thinking” out… push a button and the toy does all of the work. Although my son is growing up in an amazing time of technological advances, real life still requires problem-solving and thinking skills. Many of these are developed through childhood and good old-fashioned being b-o-r-e-d! Lesson learned the hard way. Now we’re left with cleaning up what we have and making better decisions in the future. 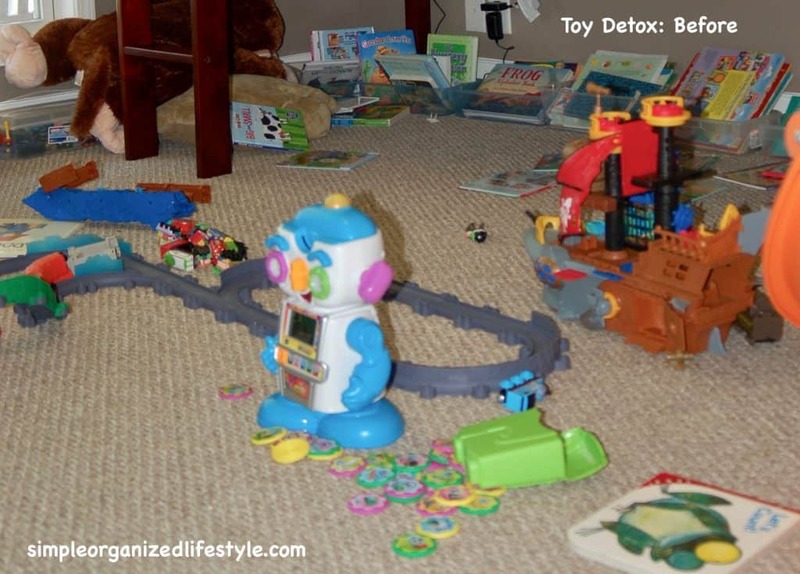 I tackled the toy decluttering process with our son’s bedroom. We also have a playroom downstairs in the basement but that’s a bigger project than we can take on right now in the midst of back to school. They all fit on one shelf beside his bunk bed. Clear bins would have been better, but everything is visible on the shelf except for the Angry Birds set in the striped monkey canvas bin. 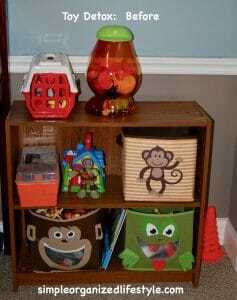 It will be really easy to have a system where clean up involves just putting a toy back on the shelf! I also decluttered and minimized the books under his bed from six bins to three. Children’s books are not a “pain point” for us. We keep them in bins in a few places through the house and donate them when they haven’t been looked at in awhile. Seriously, how do you even play in a room when you can’t even walk in the floor!?! The results of this process have been amazing in more ways than just one. The toy decluttering is great by itself but our son has actually started spending longer stretches of time in his room now and seems so much more relaxed. It gives us more time to engage with him and that is something that money can’t buy! Anyone else on a toy detox mission? Feel free to share any tips or tricks in the comments! That is awesome! I really need to do a clean up and CLEAR out of so many things around here. Something that my mom does really well is rotating toys. She keeps 3 bins of toys and activities for the grandchildren and then rotates them every few months so they always seem exciting and new. I haven’t quite gotten that down yet however so we are still in a mess! Our playroom looks like your did all the time. Thanks for the inspiration! That is a great idea! We have a few Christmas toys that stay in storage until we put up decorations and those are always a hit… I’m sure if they were left out, they would never be touched. 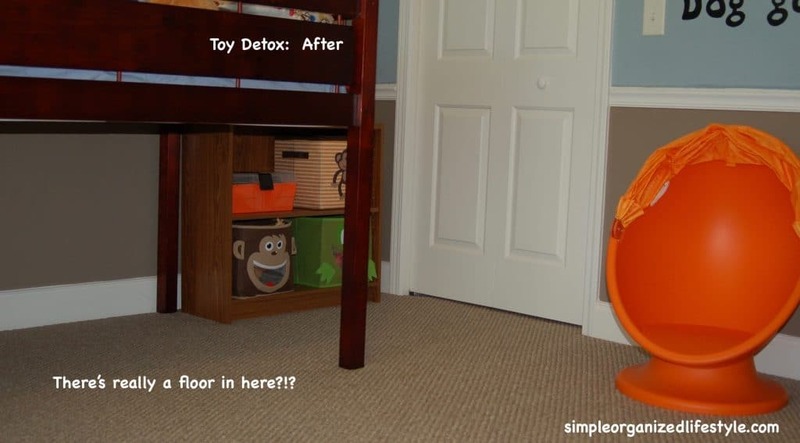 Haha Your pic of the toys on the floors is our everyday reality. The toys are being removed only when we need to vacuum and clean the floors, aaand they are back 2 minutes after ? Yes… it’s amazing how fast it happens! Daily trip hazards lol!